Below are real portraits of real everyday children….not models, that I photographed in years past for this on going Kids project. This is a fantastic opportunity for you to have amazing portraits of your children and contribute to CHOC Children’s Hospital. For only $95 donation that goes directly to CHOC Children’s Hospital you can have a private photo session of your child or children at a gorgeous park in Irvine. Whether you have 1 child or 5 children they can each be included for the same donation. 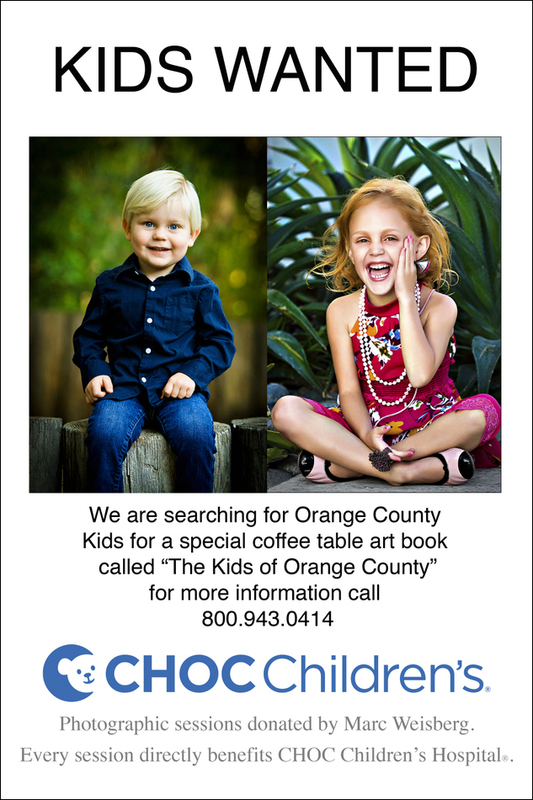 Each child photographed will appear in a lovely coffee table book Kids of Orange County, later this year. Want more info or want to sing up for a session? Email me or call 800-943-0414 to enroll your child. See a quick video by Miguel Quiles with Kenta Honjo, Sony Alpha Product Manager here. 5-axis Steadyshot: Having the ability to use practically any lens with a stabilized camera body is huge. It’s easily one of my favorite features on my A7II and I’m happy to see it in this camera. Faster AF: The difference between the AF on the new A7RII vs the older version is night and day. The system has matured tremendously which should make a lot of pro shooters very happy. Internal 4k recording: This was one of the biggest surprises for me. Having the ability to shoot 4k with a full frame camera (the first of its kind) opens up a whole new world of possibilities. I’m definitely going to upgrade my workstation when this camera is released. A7II body design: One of the major reasons I upgraded from the original a7 was the new design on the A7II. The grip was better, and the shutter button and layout overall was vastly improved. The A7RII essentially has the same look and feel that should appeal to photographers who are transitioning from larger DSLR bodies. High ISO/MP combination: Unlike the upcoming Canon 5DS/R, the Sony A7RII makes no compromise when it comes to high megapixel and low light capabilities. The native ISO on the A7RII is 100-25600 compared to 100-6400 on the Canon. The A7RII is expandable up to 102400 which is pretty insane given all of the other features mentioned above. Oh, did I mention that it’s also nearly $700 less than its closest competitor, the Canon 5DSR? That, my friends, is a wrap for me. Sony knocked it out of the park with this new release. It has everything for the aspiring professional photographer and videographer, all in one package that’s more affordable than a lesser-equipped Canon or Nikon. I’ll definitely be in line to pick this up as soon as it’s released. Fellow Sony Artisan of Imagery Miguel Quiles interviews Kenta Honjo, Sony Alpha Product Manager at the #SonyAlpha press release in NYC about the a7rII. A quick and cogent read. Free of marketing from my friend Paul Gero. 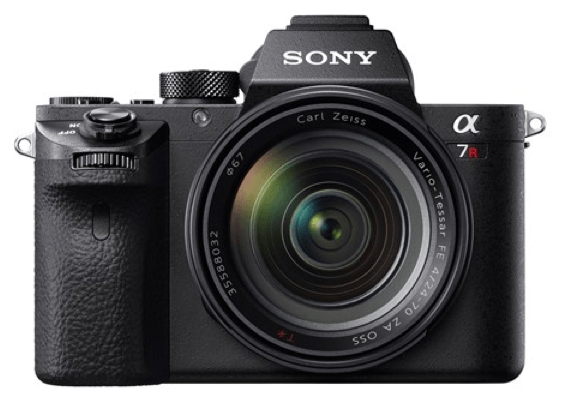 Sony shocked the photo industry on Wednesday in New York City when they announced the a7rII as the replacement to the highly regarded Sony a7r. In a relatively short period of time, Sony has done what seemed to be unfathomable with the release of this new camera and significant upgrade to the a7r in about 18 months time. The camera includes a large 42.4 megapixel sensor, and also includes 4K video that is recorded on board — no external device is required to acquire in 4k. This is huge because with the competition doing 4k in camera, they had to address that need. I expected that they would do this and they delivered. The large file size was also expected and they delivered with an increase from the previous 36 megapixel size of the original a7r. Sony also added their impressive 5 axis IBIS (In Body Image Stabilization) which first came onto the scene last December 2014 with the a7ii. A great addition especially when used for slow shutter stills or when shooting video. The camera also has a silent shutter which is something that the a7s only had and is wonderful for wedding photographers trying to stay truly silent at an event or a wedding or a news photographer photographing a pro golfer’s back swing, a courtroom proceedings or shooting production stills on a Hollywood backlot. The build quality matches the a7ii which also is beefier and more robust and this shutter is rated at 500,000 cycles. After using the a7ii I know how much it improved the feel, fit, finish and performance compared to the original. It just looks more aggressive as well as feels more substantial. Sony has also created some real surprises for me with the release of this camera things I did not even think would be possible. 1) The 399 phase detect pixels focal-plane phase-detection AF points – the world’s widest AF coverage on a full-frame sensor (according to the Sony release) makes AF performance significantly faster than the original and is said to improve over the a7ii. That is huge especially when you consider that the camera is pushing a file that is nearly twice the size of the a7ii files. 2) This new array on the sensor gives the camera a distinct advantage over any competitor because it allows for high-performance AF with a 3rd party adapter like a Metabones which can be used with Canon and Nikon lenses. It also allows the use of the Sony LA-EA3 adapter instead of the LA-EA4 adapter which houses a translucent mirror. This means that A-mount lenses will AF more quickly than before. This is big because it could really appeal to newspaper and magazines staffs that have a large collection of legacy lenses by Canon and Nikon — because it appears that the Sony camera will allow the DSLR lenses to perform as if on a DSLR body. If they perform as good OR better on the smaller, lighter, less pricey Sony (that also has killer video — big for multi-media) — why not use them. Also Sony A-mount lenses will be able to be more seamlessly used on this new body with a less expensive mount that does not have to use a translucent mirror to focus. Immediately that expands the amount of useful Sony lenses for the E mount system. I believe this could make a big improvement in their market share in the professional journalism space as well as in the wedding and portrait world where the majority of working pros use Nikon or Canon currently. 3) The EVF is an improvement with an upgraded XGA OLED Tru-Finder™. The magnification of this finder is .78 the world’s highest. If you’re not used to an EVF, I think you’ll find yourself falling in love with features such as focus magnification and focus peaking not to mention aiding in focus in low light. I can’t imagine going back to an optical viewfinder. Sony has created what they are calling their most advanced sensor which is called a back-illuminated CMOS sensor. This sensor increases the speed of processing as well as improving the high ISO performance of the camera. Will it rival the high ISO performance of the a7s? I’m not certain though it certainly should be an improvement over the other a7 bodies in the line (I currently shoot 6400 ISO without blinking an eye with the a6000 and the original a7 — I expect with this new sensor I will be very happy). Native ISO is 100 ISO to 25,600 and can be expanded to 50 ISO and 102, 400. Before this camera was announced I figured I would probably wait it out hoping for something in the smaller megapixel range. I had thought I would get the a7ii, and the a7s but with all the improvements I will get this one in lieu of the others. For my portrait work the larger file size will be a great addition. I’m a little concerned that the large files might be a bit overkill for certain aspects of wedding photography, but I think I can make it work with more SD cards and hard drives. Perhaps Sony will consider offering a Small or Medium RAW option in a firmware upgrade. But the advances in both video, AF performance and processing speed of these files make it practically irresistible. With AF speed that is better than the a7II (the same 5 fps) and more accurate AF those things trump file size for me. The Sony line has been growing quickly and steadily since the original launch of the A7 in 2013. With a speed of upgrade that is shocking in the relatively slow pace of DSLR upgrades over the years, Sony shows with this camera that it is playing for keeps. With this camera, I believe that even the most ardent DSLR supporters will have to admit that this is a camera that turned their heads.